Twenty-two million workers are exposed to potentially damaging noise at work each year. Last year, U.S. business paid more than $1.5 million in penalties for not protecting workers from noise. Noise-induced hearing loss limits your ability to hear high frequency sounds and understand speech, which seriously impairs your ability to communicate. 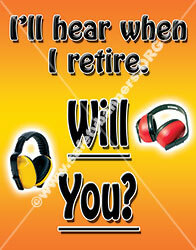 Hearing aids may help, but they do not restore your hearing to normal. Hearing loss is pervasive. It is also preventable. 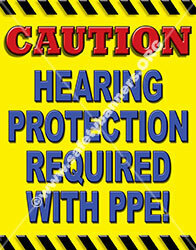 Wearing the proper hearing protective equipment can and will reduce the permanent damage to hearing. Exposure to loud noise kills the nerve endings in the inner ear. More exposure will result in more dead nerve endings. 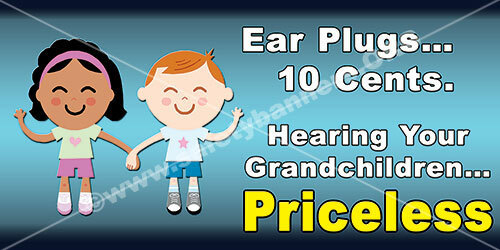 The result is permanent hearing loss that cannot be corrected by surgery or medicine. Hearing conservation programs strive to prevent initial occupational hearing loss, preserve and protect remaining hearing, and equip workers with the knowledge and hearing protection devices necessary to safeguard themselves. 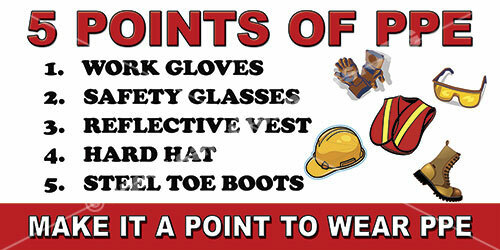 Use safety banners to keep hearing safety in front of your workers.